In the first collaboration of its kind between these groups, the Inspector General of the Department of Health and Human Services (HHS OIG), the American Health Lawyers Association (AHLA), the Association of Healthcare Internal Auditors (AHIA) and the Health Care Compliance Association (HCCA) today released a joint educational resource to assist governing boards of health care organizations carry out their compliance plan oversight obligations. In addition to governing boards of health care organizations, the document will also assist internal auditors, lawyers, and compliance officers that report to those boards. This cross-disciplinary authorship highlights the complementary roles of the internal audit, compliance, and legal functions in any comprehensive compliance program. This new educational resource provides practical ideas that boards may consider implementing in their organizations. The guidance includes processes for identifying risks, tools for improving adherence to program objectives, and effective reporting tools for board meetings. The document suggests diverse tools and tips that boards of varied sizes and resources may use. The document, which expands on issues presented in prior documents issued together by OIG and AHLA, also suggests ways to identify compliance risks in a rapidly changing health care environment. The issuing organizations state the document is not intended to set particular standards of conduct and should not be taken as legal or professional advice or opinion from any of the organizations. The document provides examples of how boards may foster a corporate culture of compliance to meet the ultimate goals of protecting the integrity and viability of the nation's health care delivery system. 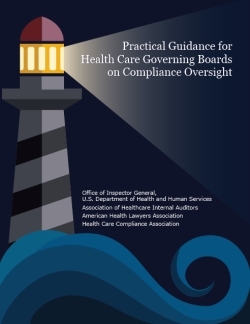 The full document, "Practical Guidance for Health Care Governing Boards on Compliance Oversight," can also be found at these websites: www.healthlawyers.org; www.hcca-info.org; and www.ahia.org. Historical guidance for governing boards of health care organizations can be found on the OIG website. HHS OIG is the largest inspector general's office in the federal government and is dedicated to combating fraud, waste and abuse and to improving the efficiency of HHS programs. A majority of OIG's resources go toward the oversight of Medicare and Medicaid - programs that represent a significant part of the federal budget and that affect this country's most vulnerable citizens. OIG's oversight extends to programs under other HHS institutions, including the Centers for Disease Control and Prevention, and the Food and Drug Administration. Read more about the OIG. HCCA is a non-profit professional membership organization with more than 10,000 members. It is dedicated to improving the quality of compliance. HCCA provides training, certification, networking, and other resources to its members. HCCA's members include compliance professionals from a wide range of organizations, including hospitals, health systems, research facilities, long-term care, physician practices, clinics, managed care, pharmaceutical, medical device, and technology service providers. For more information about HCCA, visit www.hcca-info.org.